The market is gaining substantial growth owing to growing food waste across the globe. Growing regulation on food waste followed by rising health-related issue on the cost of improper food waste management practices has generated tremendous market demand. In addition to this, the rising popularity of waste to energy conversion for electricity generation is again pushing the market growth upwards. Growing usage of green waste for fertilizer has again contributed the market growth. The latest report by Value Market Research expects the Global Food Waste Management Market to reach USD 51.0 billion by 2025. It was valued USD 33.9 million in 2018. The report foresees a 6% CAGR from 2019 to 2025. On the basis of type, fruits and vegetables led the segment by accounting maximum market share in 2018. Growing demand for vegetables and fruits leading to its excessive production followed by unfulfillment of the retailer’s standards is generating huge demand for proper waste management. In addition to this, owing to highly perishable food products is also boosting the demand for efficient waste management. In 2018, anaerobic digestion emerged as the leading product segment as it produces eco-friendly products and by-products. 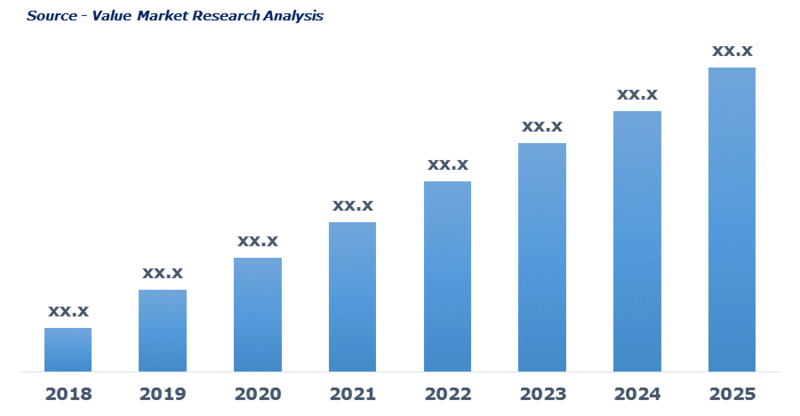 Advantages of anaerobic digestion are promoted climate change mitigation, offers techno-economic viability and environmental sustainability is driving the segment market. Strict governmental measure imposed to reduce the environmental impact caused due to food waste will foster the segment growth. By application, animal feed dominated the segment in 2018 owing to an ecological, economic and more efficient alternative method for treating waste, animal feed is driving the segment growth. Also, Waste food offers abundant nutrients to livestock followed by growing global demand for meat and meat products is boosting the segment growth. Growing awareness among the population regarding the ill effects of food waste fueled by favorable governmental norms is driving the regional market growth. Advanced Disposable Services Inc., Clean Harbors Inc., Covanta Holding Corporation, FCC Environment Ltd., Remondis SE & Co. KG, Stericycle Inc., SUEZ, Veolia Environment, Waste Connections Inc. and Waste Management Inc. are some of the prominent players of the market. As per this study the Global Food Waste Management Market was valued USD 33.9 BN (by revenue) in 2018 and is anticipated to reach USD 51.0 MN by 2025 with a CAGR of 6%. Food waste is referred to as the edible food items, organic residues, and scraps that are discarded or thrown away. Food waste management offers eco-friendly and sustainable disposal of food waste generated. Food waste management includes conversion of discarded food into a usable form through aerobic, anaerobic, incineration, pyrolysis and other techniques. Increasing food wastage coupled with low awareness regarding proper utilization of discarded food is driving the need for food waste management. Discarded food products generate economic and public health issues is again boosting the demand for proper food waste management. Also, the growing trend of waste to energy conversion for electricity generation is again pushing the market growth upwards. This detailed market study is centered on the data obtained from multiple sources and is analyzed using numerous tools including porter’s five forces analysis, market attractiveness analysis and value chain analysis. These tools are employed to gain insights of the potential value of the market facilitating the business strategists with the latest growth opportunities. Additionally, these tools also provide a detailed analysis of each application/product segment in the global market of food waste management. The broad food waste management market has been sub-grouped into type, product and application. The report studies these subsets with respect to the geographical segmentation. The strategists can gain a detailed insight and devise appropriate strategies to target specific market. This detail will lead to a focused approach leading to identification of better opportunities. Furthermore, the report comprises of the geographical segmentation, which mainly focuses on current and forecast demand for food waste management in North America, Europe, Asia Pacific, Latin America, and Middle East & Africa. The report further focuses on demand for individual application segments in all the regions. The report also covers detailed competitive landscape including company profiles of key players operating in the global market. The key players in the food waste management market include Advanced Disposable Services Inc., Clean Harbors Inc., Covanta Holding Corporation, FCC Environment Ltd., Remondis SE & Co. KG, Stericycle Inc., SUEZ, Veolia Environment, Waste Connections Inc. and Waste Management Inc. An in-depth view of the competitive outlook includes future capacities, key mergers & acquisitions, financial overview, partnerships, collaborations, new product launches, new product developments and other developments with information in terms of H.Q.